A natural sheepskin rug means luxury. A sheepskin rug can be obtained in traditional, natural shaped long wool sheepskin rugs, are rug shaped long wool sheep skin rugs and shorn designer sheep skin rugs. Designer sheep skin rugs have a foam liner. Nothing compares to the luxuriousness and durability of a sheepskin rug or its natural comfort for the human body. 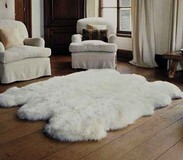 A Sheepskin rug is naturally beautiful, luxurious and comfortable. Tibetan Lambs Wool, an exotic lambskin rug, is the ultimate in luxury and fashion , and is the softest, silkiest fur rug available with a pile length of over five inches. Our Tibetan lambswool is imported from Tibet. 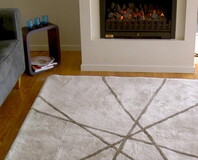 Our other sheepskin rug products are manufactured by Bowron, New Zealand. No matter what kind of sheepskin rug you purchase, you can be assured of unsurpassed comfort and luxury. 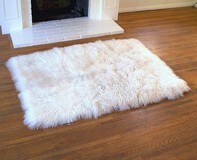 Sheepskin rug wool breaths and is static resistant. 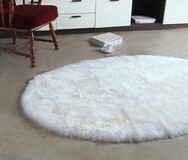 Sheepskin rugs durability is unsurpassed by other natural fibers and woven wool alternatives. If you want something you can rest your feet or entire body on, a sheepskin rug is the answer. The structure of sheepskin rug wool allows the body to be supported by millions of resilient and springy wool fibers, providing total support and comfort for your body. And sheepskin rug wool is a great insulator. Wool traps air, which insulates you against cold and heat.